Here’s what I came up with for a Diablo 3 Season 9 Crusader Build using thorns. This season, I am going with a Crusader. I played one in Season 2 and really enjoyed it. Season 9 brings with it a thorns build for the Crusader, which is something I’ve really wanted to do since thorns was buffed. Haedrig’s Gift for the Crusader is the Thorns of the Invoker which is a set that enhances and plays off of your character’s thorns ability. Naturally this build is one hell of a tank. It’s been a while since I really clamped down on a Diablo 3 season. I’d forgotten how fun they can be. I forgot all about the drive to push your character’s capabilities by various tweaks to skill choices and gear sets. Looking for a group to roll with in Diablo 3? The Lone Gamers are ALWAYS looking for new players. Look for our Clan and Community within Diablo 3 and join us on Discord! 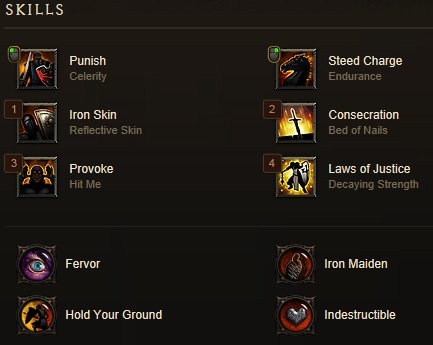 The skills I currently have with my Diablo 3 Season 9 Crusader Build. You’ll notice that this build has no resource spenders. This plays into gear selection later. Cooldown reduction is key to versatility. Block chance increases are huge and you’ll see that I went with Hold Your Ground and Punish with the Celerity rune. Thorns is all about getting hit and drawing the enemies in to do that, so Provoke is at the center of this build. I use provoke to keep the mob’s attention on me. This becomes even more important when playing in a group because by default, this build is the tank of the group. The Hit Me rune also gives a bonus to block, which is helpful later on. Punish is key here because of Hardened Senses which increases your chance to block by 15% for 5 seconds after hitting an enemy. Steed Charge with the Endurance rune is helpful when running rifts or hunting for bounties or elites. It lets me run through the normal monsters to find what I want. Between the Cool Down Reduction from items and skills and Swiftmount, I can nearly constantly run Steed Charge. If I don’t have a need to move fast, or my group is just slaying everything in its path, I’ll swap this out to Akarat’s Champion. Iron Skin with the Reflective Skin rune is an obvious choice. This skill increases my tank considerably while increasing my thorns damage 3 fold. Consecration with the Bed of Nails rune is a controversial one that I feel works for me. While many other professional Diablo 3 players would go with Akarat’s Champion in this slot, I find my choice to be much more effective. The cool down for Consecration and Iron Skin are the same which means the choice to dual cast is an obvious one. I draw the monsters in with provoke, wait for them to encircle me and then fire off Consecration and Iron Skin as a one-two punch. Consecration gives me a solid circle of damage around me, and Iron Skin triples the damage that the pack surrounding me takes. Consecration also gives me and any allies near me a huge boost to health recovery, which you might need it you are surrounded by monsters. I also find this skill selection to be helpful to kill the lower end trash mobs that really aren’t worth my time attacking with Punish. Laws of Justice with the Decaying Strength rune is more of a safety skill in the selection – providing great amounts of reduction to incoming damage for you and your party. 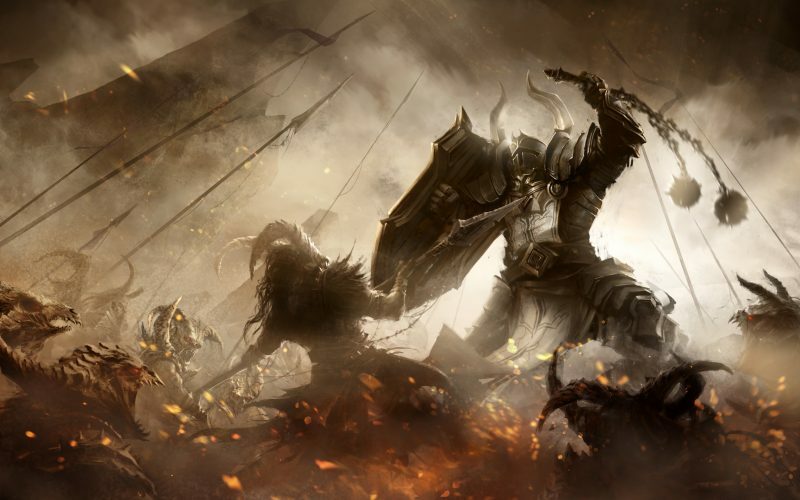 If you want more damage, you can swap out to Laws of Valor but only in parties since this Diablo 3 Season 9 Crusader Build doesn’t focus on dealing damage through normal means – Laws of Valor won’t boost your thorns damage. More on how that works later. This build is all about thorns, cool down reduction, and block making the passive choices of Iron Maiden, Fervor, and Hold Your Ground all no-brainers. The fourth passive slot was more of an option for me, so I went with Indestructible for increased survivability. Indestructible can be swapped to Finery if your character is well equipped. First and foremost, the full set of Thorns of the Invoker was an excellent start to this build. The bonuses synergize well with the skill selection to increase thorns damage and the damage generated from Punish. The set pieces provide a lot of thorns damage organically and individually. Belt of the Trove was an excellent addition. It casts Bombardment every 6 seconds which is a welcome addition to damage output but also takes advantage of the 4-piece set bonus for Thorns of the Invoker insuring that you are always seeing a 50% reduction in incoming damage, drastically increasing this build’s survivability. For the chest piece I went with the Aquila Cuirass. Considering that there are no resource spending skills in this build, I sit at 100% wrath all of the time which means that I have the legendary effect of a 50% reduction in damage taken all of the time. Combine this with the 4-piece set bonus of Thorns of the Invoker and this build becomes extremely hard to kill. For the shield slot, I’m using Coven’s Criterion which reduces damage taken by blocked attacks by 50%. Remember: Attacks that are blocked only has their damage reduced by a ranged amount not a percentage and not completely eliminated. This reduces the damage taken after the initial reduction which can definitely help out when some of those elites hit you with heavy attacks such as Hammermash can hit with at times. As for jewelry, I’m still searching for decent rolls on jewelry that helps out. The Royal Ring of Grandeur is always helpful and if you find a decent legendary that provides a helpful unique effect you could use it to swap out one of the Thorns of the Invokers set items. I am currently rocking a Hellfire Amulet that provides me the Vigilant passive effect, giving me an additional reduction in damage. The Traveler’s Pledge, The Compass Rose, and Justice Lantern all would be great options to wear, but I haven’t found any decent rolls for those… yet. For the weapon slot I am currently using Akarat’s Awakening which provides me a 25% chance to reduce all cool down timers by 1 second. This might not seem like much but when I’m in the middle of a pack of 10+ monsters after firing off Provoke I can watch my cool down timers disappear fairly quickly, allowing me to fire off a second shot of Consecration and Iron Skin while the first cast is still active. When using Akarat’s Champion in heavy mobs, especially those with ranged attackers, I find that I can keep it running nonstop. Heart of Iron gives me a huge boost to thorns based on my vitality. I’m sure there are other options between the armor slot in the cube and the worn chest piece. However, I’d highly recommend a worn/cube combination of Heart of Iron and Aquila Cuirass. Wear whichever has the better overall roll. I haven’t found anything decent for the jewelry slot but I am currently running The Ess of Johan which provides some decent additional crowd control. This build focuses on thorns and most people I’ve talked to about it think that thorns is just about enemies hitting you and taking damage in return. It’s so much more than that. This build, while providing a ton of reflective damage, also plays a lot off of the thorns stat itself – both by applying a percentage based off of your thorns stat and by increasing your thorns stat by other actions. An example of increasing damage based on thorns damage is the 6-piece set bonus from Thorns of the Invoker. Punish and Slash bonus is increased by 8x the thorns stat. Iron Skin‘s rune, Reflective Skin, increases thorns by 300% when active. This increase effects the thorns stat which increases damage bonuses that are affected by thorn’s value. This build performs very well in the tank department. At paragon 190, my toughness was roughly 64,000,000 and with rare combinations of buffs, I saw at one point a toughness of over 147 million – It’s only going up with additional paragon levels and better rolls of equipment that I’m running. Torment X was easy, tank-wise at paragon 200. I was able to tank 3 super elites, 2 groups of champions, and another elite without breaking a sweat – the problem was trying to fit them all in the same circle of Consecration. The build thrives on being highly outnumbered and succeeds at it. I find I am happiest when wading through hordes of monsters. Even moreso when playing in a party and party members bring me new monsters to play with. I’m good at holding those monsters in place – focused on me, so party members with DPS can lay into them. My current version of the build does suffer in the damage output on a single target though. I struggle to defeat super elites in a timely manner, although I can tank them all day long. I’m also a huge bonus to survivability for other party members. Laws of Justice makes allies much tougher and my heavy use of Consecration increases their recovery when they are standing beside me. All-in-all, this has been a very fun build for me. I enjoy being able to run head first into any group of mobs.